My name is Reno Chell. I am 33 and I am Curriculum Leader for Modern Foreign Languages, Specialist Leader in Education (SLE) for MFL –a government initiative! and Learning Intervention Manager for Year 10 (Head of Year) at Sandbach School in Cheshire, a boys' free school. As my job titles suggest, my day-to-day workload is very diverse. I have my teaching timetable to deliver, I manage a year group of over 200 boys and I lead a curriculum area. In addition to this, I also support some schools in the local area. Well, this is what I love about my job…. no two days are ever the same! I can go from teaching a Year 9 class on the topic of reality television shows, in German; to a meeting with a parent to discuss academic progress across all subject areas for their son; to a student who needs support in their learning; to leading a twilight training session on questioning techniques in the classroom for example and before any of this has begun, I will have started the day with a year group assembly celebrating success! You need passion for your subject area but you also need to have the ability to form positive relationships with young people. This is at the heart of all that I do. You have to show genuinely that you care about the students and their outcomes. You need to have the ability to make the learning experience memorable for them. You need to have excellent communication skills and be able to work as part of a team both inside and outside of the classroom. The most fascinating aspect of my job is having a positive impact upon the lives of the young people that I work with. It’s not just about inspiring a passion in them for your subject area, it’s about being there as a support throughout their wider learning journey. It’s fascinating as well as a privilege to be part of each student’s diverse journey and it’s fantastic to see so many develop into well-rounded young adults, who go on to achieve incredible things. I sing in the school choir and I still get nervous when the concert performance is looming! Another unusual aspect of my job is to belt out annually: “All I want for Christmas is you” with microphone, of course, to entertain the students on our 14 hour coach drive to the French Christmas markets. My passion for languages initially was the reason to become a teacher, as well as having enjoyed working in a French secondary school as part of my degree course. I felt that I had good rapport with students and I enjoyed seeing them grow in confidence to speak another language. I aimed initially to be Teacher of Modern Foreign Languages and I felt that I had got my dream job when I started out in September 2004, however, as you gain more experience, I think you look beyond your current role and your leaders encourage you to aim higher. Hence three schools later and several roles on, I am where I am today. Initially it was my Mathematics teacher and my form tutor at secondary school. They both cared about their students and they helped me to succeed. For example I always found Mathematics difficult, but my teacher never gave up until I understood it. It was her outgoing personality and her ability to make Mathematics memorable, which impacted upon me most. 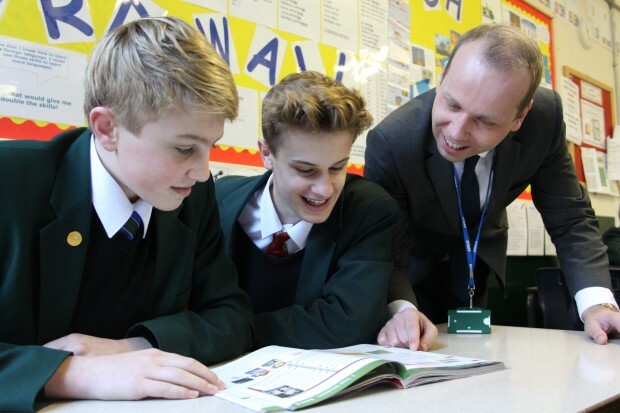 Once in the teaching profession, you continue to be inspired by the people that you work with, for example my current Headteacher has heightened my drive and ambition to aim even higher. She has provided me with opportunities which take me out of my comfort zone. She is someone that I aspire to be like in the future. I got a good joint honours degree in French and German, and then I went on to complete a full time secondary school PGCE course. It has taken me eleven years to get to where I am now. I would say don’t be so hard on yourself, it takes time to grow and develop as both a teacher and a leader. I would say: do it! I cannot imagine doing any other career. I love my job and, it’s the students that make it all of the hard work worth it. You cannot beat the buzz of success that leading and teaching in education brings. Contact your local secondary school about observing some lessons, go and see some learning in action. It may have changed a lot from when you were at school. In the future, I think that my job title may change, in that I will hopefully become an Assistant Headteacher, with my long term aim being to become a Headteacher. In the future, technology will continue to have an impact upon the classroom and will always enrich learning for students, however this will be in tandem with the teacher, who's role it will still be to inspire and enthuse the students that they work with. However, the fundamental aspect of my job that will never change is my commitment and passion to do the very best that I can for all the young people that I work with. Well done in your career journey so far and may you become a Head Teacher in the future.